More and more of us are opting to use granite paving in our gardens – and it’s really not hard to see why. Granite is such a strong and versatile paving material, making it ideal for use in a wide range of gardens. It’s most commonly used for patios, but there are so many other ways to put it to good use if you are feeling adventurous or just want more of it in your outside space! To get you inspired for your re-design, here are five fantastic uses for granite paving in your garden. 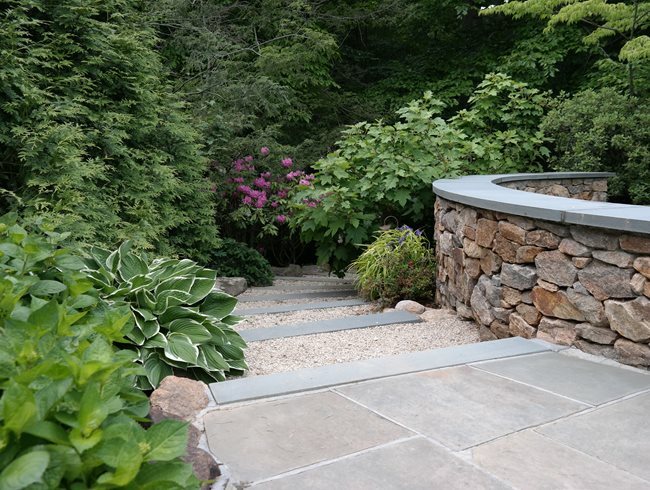 If you are going to incorporate some pathways into your landscape design, granite is the ideal option. Due to its strong, durable nature, it is perfect for high-traffic areas, so it will stand up to footfall in even the busiest of gardens. You could opt for a meandering stepping stone path in a country garden, or a long, straight path in a more formal outside space. If you have a garden that is set across a few different levels, then create unity by using the same granite paving throughout. Thanks to its strength, granite makes great raised flower beds, and these planters will help to make your outside area feel more level, despite the changing height. As we’ve already said, granite can withstand a lot of footfall, so it will be perfect for your new steps too. Granite is such a sleek and modern looking building material, so why not use your paving to tie into one of the biggest landscaping trends of 2019? Patterned paving is very much in fashion right now, and the kind you see in garden magazines is a more current take on the classic mosaic garden floors of old. Whether you opt for a circular or geometric pattern, granite in contrasting colours will look great in your landscape. If you love to head out into the garden and get the barbecue going as soon as the weather is warm enough, then why not invest in a dedicated outdoor cooking space? Granite makes fantastic worktops – chances are you or someone that you know already has them installed in their kitchen! Paired with a state of the art barbecue or pizza oven, your new worktops will allow you to create plenty of al fresco meals with ease and in total style. If you are thinking of adding a large water feature or pond to your garden, then why not incorporate some granite paving into its design? By fixing your paving slabs to blocks or pillars that are then submerged under the water, you will be able to create the illusion of stepping stones that are floating on the surface of the water. This is such an eye-catching feature and it’s bound to become a real talking point in your garden. As you can see, there are so many different ways that you can use granite paving in your garden, and we’ve only just covered five of our favourite ideas! There is plenty more inspiration to be found online. Be sure to buy your paving from a trusted retailer, and then you will be all set to create a truly stunning outdoor space with this wonderfully versatile and attractive building material.